DC and Marvel are developing new TV sitcoms involving ordinary people who work in a world of superheroes. Powerless, based on characters from DC Comics, has a pilot production commitment from NBC reports Deadline.com. The project evokes NBC’s signature comedy series The Office, but with superheroes. Based on characters from DC Comics, Powerless is a workplace comedy set at one of the worst insurance companies in America — with the twist being that it also takes place in the universe of DC Comics….. The focus of the series is on the ordinary, “power-less” folk working at the insurance company who often envy the men and women outside their window who make headlines with their supernatural powers. Damage Control, another Marvel series for ABC, has also been given a pilot commitment according to Variety. 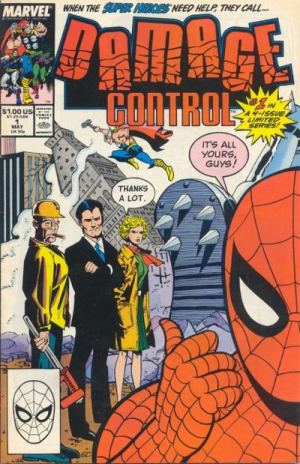 In the Damage Control comic books, the firm was founded by Ms. Ann-Marie Hoag and was originally co-owned by Tony Stark and Wilson Fisk (a notorious criminal). The company was headquartered in New York’s Flatiron Building (just like Tor Books!). Variety also reports ABC has committed to a pilot for a SHIELD spinoff, Marvel’s Most Wanted which will revolve around Adrianne Palicki‘s character Mockingbird and Nick Blood’s Lance Hunter. And American Crime creator John Ridley is developing another secret Marvel project for ABC. And we all believe the Secret Marvel Project of John Ridley is Truth: Red, White and Blue, don’t we? Damage Control was an absolute classic. I loved the issue where they tried to collect Doctor Doom’s bill. I get incredibly amused everytime I see this. Has there ever been another actor whose real name is as “dramatic” as his characters? Damage Control is gonna be an interesting take on the MCU – I think in one of the prior threads here, there was someone wishing for a greater focus on the post-Battle of New York reconstruction efforts, like what Daredevil Season 1 was doing. Has NBC been forging the Beeb’s signature on cheques as well as programming? Doom always pays his debts because Doom’s honor demands that he take responsibility for his actions. And that fool Richards is always responsible for any conflicts that he may have with Doom. Send him the bill. Well, THE OFFICE ran far longer on the Americanized version than at the Beeb. So, yeah. Signature. 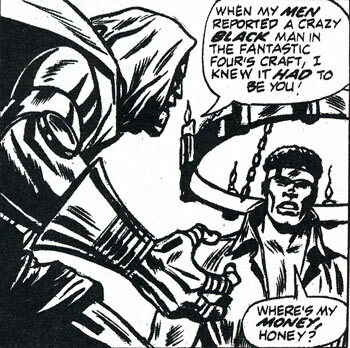 It was Luke Cage who pioneered collecting unpaid bills from Victor Von Doom. The history of the Flatiron Building, of course began with it’s being the headquarters of the late lamented Spy Magazine. I’d imagine the work being done there now by Tor Books constantly being interrupted by tourists wondering around, looking for the locations of every confrontation with Donald Trump and Arnold Schwarzenegger. I am here thinking that too many comic book based shows will cause a future disinterest in them the way it happened on a smaller scale in the 1960’s with BATMAN. Anyone who recalls CAPTAIN NICE or MR TERRIFIC will understand.